Intertops Poker and Juicy Stakes Poker are both on the Revolution Poker Network and both randomly give Gold Cards to players at real money tables. This month those Gold Cards can be exchanged for tickets to exclusive tournaments with prize pools between $100 and $2500. Any two or three Gold Cards can be redeemed for a ticket to a $100 freeroll. Any 10, J, Q, K or A cards can be exchanged for tickets to a $2500 freeroll. 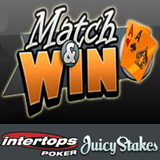 Match & Win details are available at: http://poker.intertops.eu/en/promotions/#item_1320 and http://www.juicystakes.eu/Rewards/GoldCards.aspx. You can also get a 100% up to $100 reload bonus this weekend at both Intertops and Juicy Stakes and Caribbean Poker Tour satellites also continue at both sites until September 14th. You could win a $2500 package and wind up playing in the CPT on the beautiful island of St. Maarten next month!